The capture of Iraq's second largest city Mosul by the extremist Islamic State of Iraq and Levant (ISIS/ISIL) group is a major concern not just for Iraq but for the whole Middle East. ISIS, or ad-Dawlat al-Islamiyya fi'l-'Iraq wa'sh-Sham, is probably more extreme in its Sunni Islamic jurisprudence and theology than Al Qaeda. Al Qaeda reportedly cut off ties to ISIL in February after a power struggle between the two groups. ISIL has been fighting the Asaad regime in Syria but has also been extending its territory for the establishment of their 'Caliphate' into western and northern Iraq. They claim to be setting up a Caliphate over Iraq and Syria. ISIL has its origins in Islamist groups led by the Jordanian former gangster Abu Musab Al-Zarqawi. Al-Zarqawi was known for his kidnappings, torture and brutal beheading videos in Iraq. He was viewed as the leader of Al Qaeda in Iraq (AQI), which was responsible for the bombing on 22 February 2006 at the Shia shrine of Samarra in the ancient Abbasid capital, near Baghdad, which sparked a brutal religious war in Iraq. Although Zarqawi was killed by the US in 2007, AQI continued. In towns where it had control or influence, it demanded mafia-style protection payments which helped fund its operations in Iraq and more recently in Syria. An Iraqi from Mosul told me how his relative was shot in front of his house for refusing to pay the 'tax'. Mosul is near a Christian enclave in Dohuk. It is also near the border of the Kurdish Regional area. It has a Sunni majority population, with Assyrian and Chaldean Christians, Turkman and Kurdish populations as well. It is near the ancient Babylonian city of Nineveh. An Iraqi told me how a famous tomb of the 'Jewish saint' and Old Testament Prophet Jonah is still revered nearby. The loss of Mosul to ISIL is a major concern as ISIL continue their drive south 'liberating' towns and villages, and causing a mass movement of around 500,000 people. ISIL especially targets Shia, whom they view as 'un-Islamic' and therefore legitimate targets. Christians have also been targeted. Jesuit Fr Frans van der Lugt was reportedly executed on 7 April 2014 by someone from the al Nusra front in Syria, a group formerly linked to ISIL. Frans led a group in Homs encouraging better relations between Christians and Muslims and helping the disabled. He was widely respected in the Muslim community. This did not protect him: he was shot outside his home, only a few weeks before Homs was re-occupied by Asaad's forces. While Christians will be genuinely afraid of rule by ISIL, it is the Shia and the Kurds who will mobilise against them. Already Iran has offered to help the Iraqi Government and there are reports that possibly limited Iranian forces have entered Iraq to defend the Shia shrines. This will only inspire ISIL propaganda directed at Sunni tribes in Iraq to join them against the perceived threat from the Shia. The leading Shia Ayatollah, Ali Al-Sisitani, called on the Shia to mobilise against the threat of ISIL, and thousands of Shia are joining militias to defend their cities and the many Shia shrines spread around Iraq. Significantly, Al-Sistani had previously called for calm from the Shia when the Shia shrine in Samarra was destroyed in 2006, but this time he sees a clear threat from ISIL. 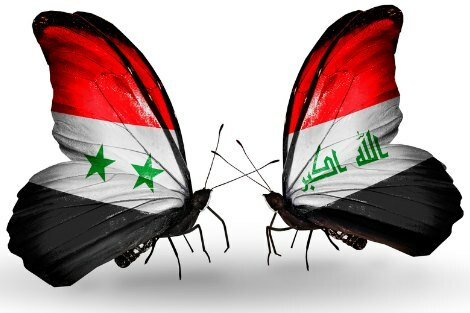 The renewed Sunni/Shia religious war sparked by the revival of ISIL will make peace a distant dream for the long suffering people of Iraq and Syria. Already Lebanese Hezbollah fighters are involved in Syria supporting Asaad against ISIL, al Nusra and other less fundamentalist nationalist groups. Fighting has spilled over the Lebanese border and there is increased risk of Turkish involvement as the entire staff and consul for the Turkish consulate in Mosul were captured by ISIL. Turkey's involvement could spark NATO involvement, as Turkey is a member of NATO, and even the thought of US forces returning to Iraq is a new headache for President Obama. This risk of the conflict spreading wider in the Middle East is a genuine international concern and there are no simple or attractive remedies available. Economic sanctions will not affect ISIL. An Iraqi told me that a relative in a town recently captured by ISIL reported that ISIL were destroying schools, because they teach 'un-Islamic courses' and that women were forced to marry mujahedeen fighters for Jihad al Nikah, a form of sexual slavery. Some Sunnis are supporting ISIL because they believe the Shia controlled Iraqi Government of al Maliki discriminated against and persecuted Sunnis. There are accounts of former Ba'athists and Sunni militias joining ISIL in the fight. Moderate Sunnis are fearful of the extremist sharia interpretations of ISIL, but also are angered at perceived discrimination by the Shia dominated Iraqi government. Sunni tribes stopped supporting ISI in about 2006 due to ISI extremism and lack of respect for tribal elders. Time will tell if the tribes again turn against the extremists. Whether the embattled Iraqi Government of al-Maliki can regroup to contain and defeat ISIL is yet to be seen. The rout of Iraqi forces in Mosul by the significantly smaller ISIL forces must be a worry to the Iraqi authorities and the US and Western countries that expended so many lives and have invested so much in the new post Saddam Iraq. Current signs are the conflict will become more sectarian and more brutal, and will be prolonged. Tragically van der Lugt did not live to experience the new horizons. Even more tragically many Iraqis and Syrians have only hope and many will die before the brutal conflict ends. Kerry Murphy is a partner with the specialist immigration law firm D'Ambra Murphy Lawyers. He is a student of Arabic, former Jesuit Refugee Service coordinator, teaches at ANU, and was recognised by AFR best lawyers survey as one of Australia's top immigration lawyers. Thanks Kerry for shedding light on this latest complex conflict. I hoped we had seen the worst in Iraq and that things might be improving in that troubled country - but ISIS seems far worse than previous high-profile extremist groups. It is a real worry, and I will 'grasp onto the hope' that the response from any coalition of the willing might be more considered and more effective than last time. Thanks Kerry for explaining so clearly the current conflict situation in Syria and Iraq. Thanks also for sharing the inspirational legacy of Father Frans. Thanks for your explanation of this complex situation. The horror faced daily by the innocents caught up in this fighting is unimaginable. At least I can turn to my God and pray for resolution if nothing else. Thanks Kerry for explaining a complex situation and for telling us about the heroic work of Fr. Frans. We can only pray for a peaceful resolution for the people of the Middle East. I have read your previous articles with great respect, Kerry, but I would beg to differ with you on your analysis of the current situation in Iraq and your suggestion as what should be done. The sad situation at present, I believe, goes right back to the end of WW I, the betrayal of their Arab allies by Britain and France and the implementation of the thoroughly discredited Sykes- Picot agreement. Previous to these the whole area had been administered as part of the Ottoman Empire. Since then the only thing which has held Iraq together, under the British-supported monarchy; the dictatorial regimes which followed; the American interregnum and what followed that, including the present corrupt, nepotistic and sectarian regime, has been force. This has been force of a particularly barbaric sort whoever was exercising it. No one involved in that country or the region has clean hands. Anthony Cordesman, a knowledgeable and respected American commentator on the Middle East, suggested that, whatever else happens, al-Maliki; his family and cronies need to be removed from power. Supporting al-Maliki's government is jumping into bed with the theocratic regime in Iran; Hezbollah and the Syrian government. That would be idiotic and make things far worse than they are. Some commentators have previously suggested Iraq would break up into three independent entities: a Sunni enclave in the north; Shia in the south and an independent Kurdistan. I think that is what is happening. Edward, I am not a Maliki fan, but if forced to choose between the Iraqi Gov and ISIL, this is the current dilemma. Sykes Picot has a lot to answer for but I would not want ISIL to be the winners out of busting the old national boundaries. Thank you Kerry. This is a help in fathoming what is happening. How much of this can be laid at the feet of GWB? St Augustine once observed twin boy babies at their mothers breast. Their misguided survival instinct had brought them to a display of rivalry so fierce that they each were trying by whatever means they command to harm and drive the other away. He commented that the innocence ('in -not; nocens -harmful) of children consists not so much in the goodness of their intentions but in the weakness of their limbs. As they develop the ability to inflict real harm, hopefully they learn restraint. Similarly nations who can now develop enough power to destroy the earth and all life on it, will hopefully learn the need for cooperation. Unfortunately there is not much sign of it yet, even in the competing religions, and much less in business and politics. A first step would be to accept it AN IDEAL. After that we can only hope and pray. I once met a British Military Intelligence officer shortly after the end of WW2 who warned me: "If you ever meet anyone who claims to know what is going on in the Balkans, avoid them like the plague. Nobody can possibly understand the complex multiplicity of interacting variables that constitute the relations that exist between the most tribal of the people in Europe." His warning comes back to me when I hear/read what commentators/political leaders have to say with regard to Iraq. Edward Fido does well to point out the artificial creation of Iraq (not that much dissimilar to the artificial creation of Yugoslavia). The fissiparous tendency of such concoctions can only be contained for so long. We are reaping the inevitable consequences of a geo-political solution drawn up by elites blinkered by an imperialist mindset. My solution - the sooner the UN Security Council gets its act together the better, before those with a vested interest, especially USA and Iran, get together to work out something for their "national interests" and not those of the unfortunate Sunnis, Shias and Kurds. Kerry, as I said previously, I am an admirer of what you write. When I used the word "idiotic" I was referring to a possible political choice by the West which I thought would be infelicitous. We are dealing with the Middle East, where "politics" is decided by the barrel of a gun. What foreign intervention takes place will be decided by previous alliances, which may be slightly more fluid than they once were and the geopolitics of oil. The USA is well on the way to self-sufficiency in oil. This was not the case when it previously intervened in Iraq. Isis/ISIS/ISIL, are, eerily enough, no more bloodthirsty or violent than the al-Saud family when they carved their way to power and consolidated it in the country now named after them. We have diplomatic and trade relations with the Saudis and Qataris, who espouse the same Wahhabi-Salafi creed as Isis and are its main financial backers . If foreign intervention tilts the current balance of power in Iraq it could lead to the sort of communal revenge which the Middle East is famous for and a further exodus of refugees, who very few countries, including ours, are keen to accept. Our prayers are for the people of Iraq and Syria and all around the world - for peace and stability and for the end of these senseless killings and violence. Over the last few years the High Court has made several decisions which found the Government wanting when making decisions regarding asylum seekers. Inevitably the cases are decided on the basis of whether a power was correctly applied or interpreted. Sometimes the results favoured asylum seekers, sometimes they upheld the position of the Government. A case this week in which the applicant lost may have significant consequences.